Simply beautiful. 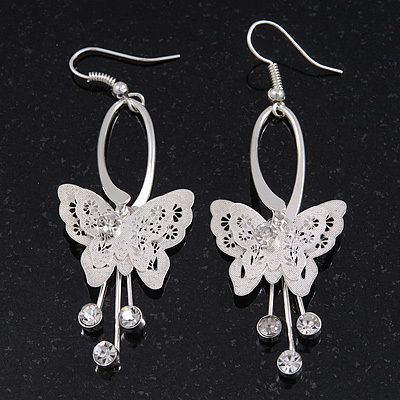 These delicate Silver Plated Filigree Diamante 'Butterfly' Drop Earrings will complement any outfit. Featuring a lightweight double butterfly design, crafted in silver plated metal and decorated with filigree detailing and crystal accent. The earrings measure approximately 7cm in length, with fishhook backings for a comfortable and secure fit. Get these earrings as a gift for yourself or someone else today!